With today’s diverse and busy lifestyles, we want to provide you with the care and attention that is as unique and special as you are. To give you the quality care you deserve, Dr. Shapero and Staff attends regular postgraduate seminars on a variety of topics. These topics include many of the needs of an active family. From prenatal care through postpartum recovery for baby and mother, Dr. Shapero is well versed in neonatal and children’s health issues. We have helped countless numbers of children with ear infections, ADHD, ADD, growing pains, asthma, and many others. 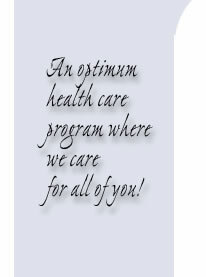 We are ready to help you handle the variety of health issues that occur as one goes through life. Such issues as injuries on the job, automobile accidents, digestive disorders, jaw pain, breathing problems, headaches, and many more have been resolved with remarkable professionalism and expertise. Delicate topics such as women’s health issues or problems of ageing are yet another area in which Dr. Shapero has had extensive study. For those of you who are more active than others or perhaps you have an up and coming athlete we are equipped to help athletes of all levels reach peak performance in life and in the field. If you are looking for a doctor who can help you achieve optimum health and well being from birth to beyond and maximize your quantity of life with quality of life than this is the place for you. We do not settle for mediocrity but rather are consistently willing to raise the bar to achieve a higher degree of excellence. Remember the results you have today are from the actions you made yesterday. We welcome you to cross through the gateway to help you have a better healthier and more vibrant tomorrow by making better decisions regarding your health based on better information today.